2. 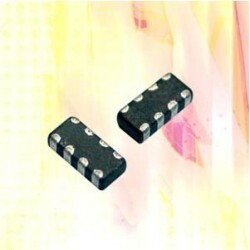 Availing in (3;4) lines by a single chips; it can very usefully adopted in high density circuit designs. 3. Heat generation and crosstalk between adjacent circuits is minimized. 1. Waveform correction in personal computers; electric equipments; communication equipments; OA equipments; and provides radiated noise countermeasures in interfaces and harness connecting parts. 2. Prevents noise intrusion in videos; LCD module; etc.